Our New England Clam Chowder is fine for a quick meal. However, sometimes we “dress it up” for special guests. Here’s an easy method. Boil the potato until tender, then dice. Sauté finely chopped celery and most of the bacon, and set aside. 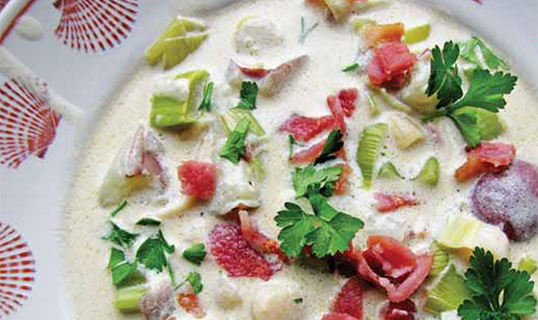 In a stockpot, combine the New England Clam Chowder and half-and-half. Heat slowly, stirring frequently. When very hot, add the diced potato and celery, and stir until warm. Ladle into serving bowls, then garnish with crumbled bacon and parsley. Salt and pepper to taste.